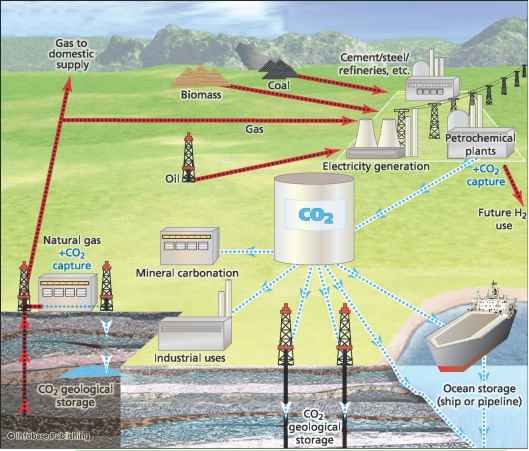 Many of the technologies required for large-scale geological storage of CO2 already exist. Because of extensive oil industry experience, the technologies for drilling, injection, stimulations, and completions for CO2 injection wells exist and are being patterned after current CO2 projects. In fact, the design of a CO2 injection well is very similar to that of a gas injection well in an oil field or natural gas storage project. Capture and storage of CO2 in geological formations provides a way to eliminate the emission of CO2 into the atmosphere by capturing it from large stationary sources, transporting it (usually by pipeline), and injecting it into suitable deep rock formations. Geologic storage of CO2 has been a natural process within the Earth's upper crust for millions of years; there are vast reservoirs of carbon held today in coal, oil, gas, organicrich shale, and carbonate rocks. In fact, over eons CO2 has been derived from biological activity, igneous activity, and chemical reactions that have occurred between rocks, and fluids and gases have naturally accumulated in the subsurface layers. The first time CO2 was purposely injected into a subsurface geological formation was in Texas in the early 1970s as part of an "enhanced oil recovery" effort. Based on the success of this effort, applying the same technology to store anthropogenic CO2 as a greenhouse gas mitigation option was also proposed around the same time, but not much was done to pursue any actual sequestration. Not until nearly 20 years later, in the early 1990s, research groups began to take the idea more seriously. In 1996, Statoil and its partners at the Sleipner Gas Field in the North Sea began the world's first large-scale storage project. Following their lead, by the end of the 1990s, several research programs had been launched in the United States, Europe, Canada, Japan, and Australia. Oil, coal mining, and electricity-generating companies spurred much of the interest in this technology as a mitigation option for waste byproducts in their respective industries. Since this initial push, environmental scientists—many connected with the IPCC—have become involved in geologic sequestration as a viable option to combat global warming. The significant issues now are whether the technique is (1) safe, (2) environmentally sustainable, (3) cost effective, and (4) capable of being broadly applied. 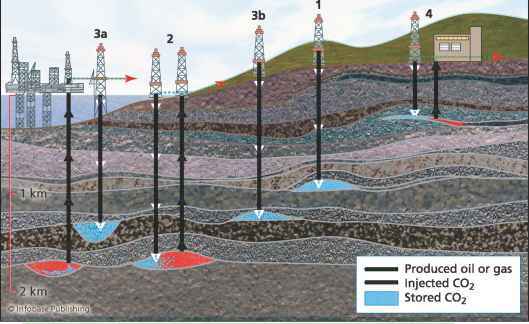 Geologic storage is feasible in several types of sedimentary basins such as oil fields, depleted gas fields, deep coal seams, and saline formations. Formations can also be located both on and offshore. Offshore sites are accessed through pipelines from the shore or from offshore platforms. The continental shelf and some adjacent deep-marine sedimentary basins are also potential sites, but the abyssal deep ocean-floor areas are not feasible because they are often too thin or impermeable. Caverns and basalt are other possible geological storage areas. C02 can be sequestered in deep underground geological formations. Not all sedimentary basins make good candidates, however. Some are too shallow, some not permeable enough, and others do not have the ability to keep the CO2 properly contained. Suitable geologic formations require a thick accumulation of sediments, permeable rock formations saturated with saline water, extensive covers of low-porosity rocks to act as a seal, and structural simplicity. In addition, a feasible storage location must also be economically feasible, have enough storage capacity, and be technically feasible, safe, environmentally and socially sustainable, and acceptable to the community. Most of the world's populations are concentrated in regions that are underlain by sedimentary basins. The most effective geologic storage sites are those where the CO2 is immobile because it is trapped permanently under a thick, low-permeability seal, is converted to solid minerals, or is absorbed on the surface of coal micropores or through a combination of physical or chemical trapping mechanisms. If done properly, CO2 can remain trapped for millions of years. When converting possible local and regional environmental hazards, the biggest danger is that if CO2 were to seep from storage, human exposure to elevated amounts of CO2 could cause respiratory problems. This is why these storage facilities are closely monitored. Announced in November 2007 in the Salt Lake Tribune, the U.S. Department of Energy (DOE) is planning on spending $67 million over the next decade on a technological solution for climate change that will be tested in Utah. CO2 will be pumped into a mile-deep (1.6 km) rock formation under Carbon County for long-term underground storage. According to Dianne Nielson, Utah governor Jon Huntsman Jr.'s energy adviser, "I don't think such technological methods are as far out as some people say. In Utah, we have a leg up on research and development." Energy and policy makers in Utah see this opportunity as a way to offset fossil-fUel pollution produced by power plants and energy development. Brian McPherson, an engineering professor employed by Utah Science Technology and Research (USTAR) to develop commercial applications for new technologies from Utah's major state universities, is currently involved in cutting-edge research involving carbon sequestration engineering. A total of $88 million is being spent on research and testing primarily in the Farnham Dome formation. This is the location of abandoned oil and gas fields in the southeastern corner of Utah near the Navajo Indian Reservation. The project could expand and cover areas that run from New Mexico to Montana, however, because there are additional underground geological basins that have an enormous storage poten-tial—possibly enough to hold up to 100 years' worth of carbon emissions from major sources. In this project, liquefied CO2 will be injected into muddy layers of rock about 5,000 feet (1,524 m) below the desert surface. A layer of impervious shale caps the formation. Farnham Dome already contains a natural pool of CO2 that formed between 10 and 50 million years ago that was harvested commercially until 1979 for the manufacture of dry ice and soft drinks. Governor Jon Huntsman is actively looking for ways to reduce Utah's impacts on global warming. He was one who joined California governor Arnold Schwarzenegger in signing the Western Climate Initiative, with a goal to reduce greenhouse gas emissions 15 percent region-wide by 2020. 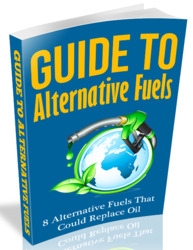 According to Brian McPherson, "Carbon sequestration will be a good short-term solution for dealing with climate change as the world shifts to renewable energy sources that are now in their infancy." Pure Energy Corp., the Navajo Nation, and the New Mexico Institute of Mining and Technology.